I wanted to write a review of the Nexus 7 tablet but decided the specs were well covered elsewhere on the web, so I took a deep look into the tablet and how it exists amid my technology. It is only fitting that I wrote the majority of this post about my Nexus 7 using my Nexus 7, and I largely did it in the airport after churning on my review for a few weeks. From my brain to my thumbs onto digital paper of my Google Drive by way of my Nexus 7 before being transferred over to my WordPress blog. I am quite happy, and I wager quite heavily that I am happier than I would have been with an iPad mini. The tablet is slick, responsive, and quite capable. I bought the Nexus 7 the same day that the 32GB version went on sale. It arrived on my stoop 2 days later. I chose the Nexus 7 for a few reasons, largest of which was the level of integration available to Google but also because while I enjoy my iPhone I was dissatisfied with iOS and its limitations. Having used the wife’s iPad I felt I wanted the smaller form factor, so the Nexus 7 leapt to the top of potential candidate systems. I explored both the Kindle and the Nook tablets but felt unimpressed. 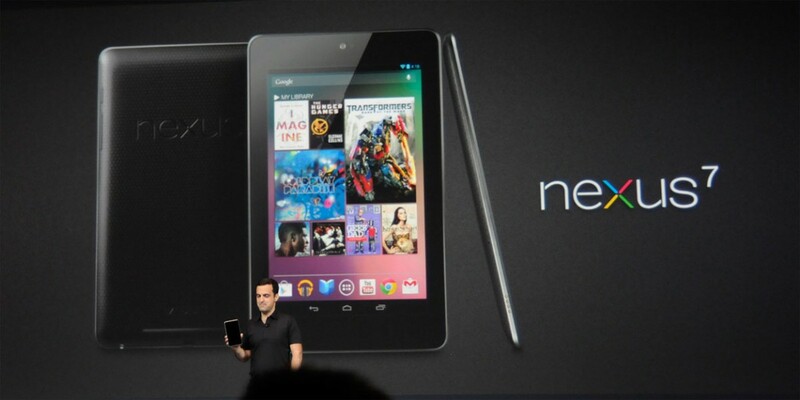 When I compared price to hardware, the Nexus 7 won the battle. I feel it’s disingenuous to give you my review of the tablet without also introducing you to the world of technology I am swath in. The Nexus works for me and I think it will work for most of you, but also understanding how I use it and why I use it is important for others to know so they can draw similarities from my experience. Desktop PC – Custom built tower courtesy of NewEgg. iPhone 4s – my primary phone, it remains attached to me from the moment I wake to when I set it with the next day’s alarm. Nexus 7 tablet – the most junior member of this squad but quickly becoming my invaluable piece of technology. Nook Simple Touch eReader – My personal library. With so much of my day spent staring at projected light and screens I really enjoy reading on an e-ink display. I won’t be giving a hardware review of the N7, there are plenty of those available online already, instead this post is meant to show you what I think about it by showing you my work flow and processes. The majority of my use on the Nexus 7 is as another vessel by which to consume media. I watch YouTube, TED Talks, and movies. I listen to music and podcasts. I read news, blogs, books, social media and comics. I even wrote a simple script which generates what amounts to my own personal morning newspaper. I named it the Trick Dispatch, and is something I’ll be blogging about in the future after I improve the content and process. Rooting the Nexus 7, while not a single-button action, is very straight-forward. The tutorials out there made the process quite painless and easy to do. My primary complaint around the Nexus 7 is that there are still some serious holes in the apps available for Android, or in the quality of apps for Android. For some, there is simply no parallel between what is available on iOS. The most clear example I can provide is iOS’s Tweetbot Twitter client. No Twitter client, free or paid, on Android comes close to the feel and experience of Tweetbot. They’re either clunky, poorly designed with their UI, or just incomplete in terms of functionality. Admittedly, I probably rate in the power user range when it comes to Twitter, but this is definitely one area that converts from iOS to Android will feel pain. That said, the availability of apps for both iOS and Android has improved dramatically since I left Android behind. It is obviously still not 100%, with companies opting for iOS rather than Android when forced to choose, but it’s now the minority of big companies which don’t support both. Secondly I find the lack of a quality rear-facing camera frustrating, especially since I rely on the Nexus in my meetings. I know, as my friend Brian said, Google doesn’t want Nexus 7 users standing in concerts holding up their tablets to snap photos – I get that. But I do wish I could just snap photos of whiteboards in meetings, or of documents for emailing etc. Dealbreaker? Not for me. But it is frustrating. Now that I have a tablet I am quite happy with, I find myself wondering what the next piece of technology I will lust over is. One thing I’d like to get is a fitness tracker of some sort, whether it is FitBit, Nike Fuelband, or one of the other options out there. As exercise has risen as an activity I do regularly, I am wishing to dive into a more “quantified self” sort of tracking for it. We’ll see!